A women’s cycling team is kind of like a sorority, but instead of paying money to join you pay with blood, sweat and tears. I’m not being over dramatic…you literally do bleed, sweat, and ride until you emotions are no longer under your control and you cross the finish line and burst into tears, for your team. Some of the best riders in the peloton aren’t the ones who win the race but the team behind them. There’s a reason pretty much the first thing out of a winners mouth every time is “this wouldn’t have been possible without my team”. Teams are built by management, and of course they look at results and how a rider can handle themselves in the peloton, but another factor is how the riders personality is going to fit with the team. That’s something that Zach Bell, my director on Rally UHC Cycling, takes very seriously when considering new hires. I’ve been on a team with a great atmosphere before, and a team with a toxic and horrendous atmosphere, and I can confidently say that the dynamic of Rally UHC Cycling is like no other. Even before I joined the team I would watch from a distance as they laughed and danced around before the races. 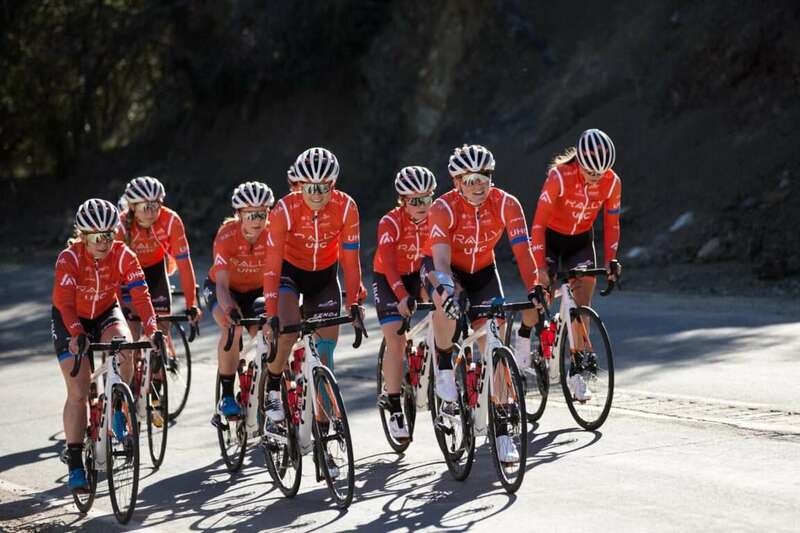 When I finally made the cut to join them in orange I was thrilled to discover the fun loving and professional attitudes of the riders as well as the staff. The inside jokes were plentiful. Group chats were constantly going off and when I wasn’t at the races or camps I was constantly in contact with at least one teammate a day to discuss nothing related to cycling at all. On this team I found people that I will hold in my heart for the rest of my life. In the beginning of March our team experienced something I hope no one ever has to go through. We lost a member. After the news came out I think most of us were in shock. Because of the timing of it we had to decide if we would race the Redlands Bicycle Classic, the first stage race in the National Race Calendar, and a relatively large race in the United States. For me it was a no brainer, yes, we had to race, because the last thing I wanted to do was to be home alone trying to make sense of what had happened. All I wanted from the moment I’d hung up the phone in a daze was to be with my team, for us all to hold each other. The team did decide to race, and our team owner, Charles, helped us through our emotional pain in the best possible way. He contacted all the riders who weren’t racing in California and asked if they’d want to fly down so we could all be together. Most of the team agreed, and for two days of the race we had the majority of the team in Redlands. As riders who hadn’t seen each other in weeks hugged and laughed and cried I looked around and felt nothing but gratitude that I can call each and every one of those girls my teammates. That week racing was without a doubt the most emotional week I’ve ever experienced. We are a group of females, brought together by a mutual love of cycling, but who are vastly different human beings. Some of us struggled more than others, but we did so as a unit. The race itself was one of our most successful Redlands’s. We managed to win two stages, and on top of everything it kind of felt like winning a stage of the Giro after a two year dry spell. There wasn’t a day that tears weren’t shed, but I wouldn’t have wanted to spend that week any differently. Fast forward another week and Rally made it possible for all the riders who were interested to fly to Minneapolis so we could lay to rest one of the most dedicated, smart, incredibly hard working people I’ve ever had the pleasure of meeting. We sat together, all the Rally UHC Cycling riders, smushed into a single pew. When Kirsti Lay spoke, Emma White went with her to the stand. Not to say anything, but to be there for Kirsti, behind her, having her back, just like we always do in races and in life. Recently another of my teammates was struggling to get back to training after what’s been going on. When I found out I immediately called her, and I found out the next day that as the word spread among us she received a call or a text from every single one of her teammates. I’ve asked my director before, jokingly, if it’s harder talking to us knowing that we all talk to each other about everything. Nothing stays secret in our team for very long, I don’t know if it’s the same on other teams. The last month in particular has brought us together. I couldn’t have imagined it was possible for us to get any closer, but apparently it is, and I know personally I wouldn’t have known how to deal with everything without them. We are truly a single unit off the bike…and on the bike. Watch out world.